With each new season comes new trends and quirks. New little treasures to place around the house and quirky outfits that make you smile. I can say wholeheartedly that fall is my favorite season. It’s when the leaves turn amber shades, when family comes together and on a personal note, it always makes me nostalgic for when I fell in love with my husband. This year, my favorite trend is anything fox related. I love their pouffy little tails, the orangey color of their fur and the little heart shaped noses. I just love all the things! I’ve picked out some of my favorites for this season. How about this foxy man from Etsy shop Chasing the Crayon? I just want to cuddle with him! Her whole shop if full of whimsy and precious prints. I want them all! Wouldn’t this rug from Anthro be just precious? Picture it now! I see it in my entry way welcoming everyone that comes through our door. Just dropping by to say hello? 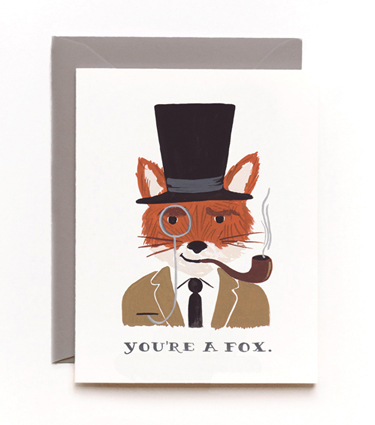 How about this perfectly adorable card from Rifle Paper Co? I would be delighted to receive this happy little guy. There is always more to come!